If you aren’t a comic book fan, today’s comic probably won’t make an awful lot of sense to you. It’s time for a lesson in nerdery. Those of us who love comics are familiar with one Robert Liefeld, industry pariah. In the late 1980s and early ’90s, he was responsible for some issues of Marvel’s The New Mutants and X-Force. In the process he co-created Cable, a massive gun-toting, outrageously muscled shoot-first-ask-questions-later cyborg anti-hero from the future. Liefeld was responsible for creating many comic book stereotypes, including anatomy that goes beyond impossible and gallops full speed into intelligence shattering. Don’t believe me? Check this out. You will never see a greater collection of bulging muscles, poorly drawn faces, ridiculous costumes, massive knockers, ballerina feet, and pouches. Seriously, he must have gone to Sam’s Club and purchased the Pouches Super Saver pack. Rob has pouches for days! Later, he proceeded to create even more stereotypes when he quit Marvel Comics with several other prominent artists to found Image Comics and make his own creator-owned property, Youngblood. There was just one problem: all the people who formed Image were artists and most of the time, artists are not good writers. Somehow, this trash caught on, too. Image first started to really take off when I was in seventh grade. I was a huge fan of X-Men and I remember the condescending looks of a particular comic shop owner when I would come in and buy the most recent issue of Andy Kubert’s X-Men instead of the latest suckfest released by Image. I remember thinking Spawn looked an awful lot like Spider-Man and Youngblood just seemed like an attempt to switch the Mortal Kombat generation from X-Men to something that promised more violence and mayhem. Actually, originality was never Liefeld’s strong point. 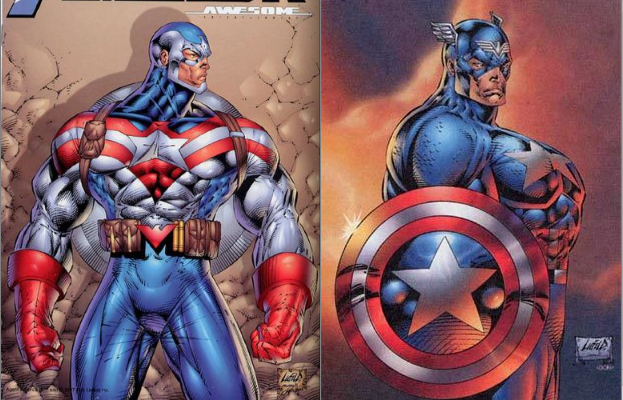 After his Captain America series was cancelled, Liefeld designed his own character for the unused plots named… Agent America. Now the question is can you tell the two apart? Still, maybe we haven’t been entirely fair to Liefeld. Before taking figure drawing in college, I found myself having difficulty drawing people of different body types. When creating character designs, I most frequently found myself referencing my own body, hence why so many of my older characters are overly thin with abnormally long, gangly limbs. Liefeld reportedly never had the luxury of a drawing class (obviously). Perhaps he is just drawing what he knows?